Even though I'm happy with the health effects of my diet, and my weight is stable in a healthy bracket, I still consider myself a little overfat. Having eliminated most plants from my diet, and given that I believe that weight loss arrived at by enduring hunger is likely to reflect loss of lean mass, not fat, one might think there was little left for me to try, but that's not quite true. There are two obvious changes I could make. Possibly to the detriment of science, but in the interest of speed and because of the plausibility of synergy, I've decided to try both at once. The first involves deepening my level of ketosis. Most of the times that I have measured the level of β-hydroxybutyrate in my blood, it has come out surprisingly low, maybe 0.2 to 0.4. This is much less than the Phinney-and-Volek-recommended nutritional ketosis range that starts at about 0.5 mMol. According to them, benefits increase until about 3.0 mMol. Here is the graphic from their book, which I borrowed without permission from Jimmy Moore. I hope he doesn't mind. I really don't know what the y-axis means, but it's clear what their recommendations are. and so I distrust nutritional databases. How do I know how much of the bacon grease absorbed into my portion of the scrambled eggs, and if there are also pieces of bacon in it, do I need to take them back out and measure them separately or assume I got an amount proportional to what went in? 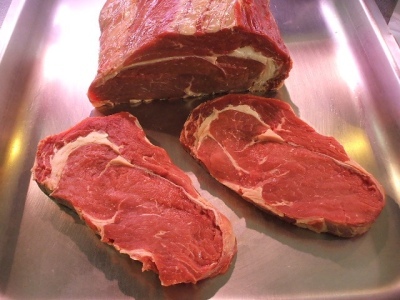 The nutritional composition of homemade broths are anyone's guess, particularly when there are bits of meat in it. Because of this complication, when I did that tracking last time, I felt restricted to a subset of foods, and even then the imprecision bothered me. So I decided not to do it this time. Nonetheless, I still get to develop my own intuitive sense of what's going on by taking ketone measurements. My basic strategy is that when I feel hungry, I take what seem to me small portions of meat, relative to what I had been eating, and eat lots of fat for satiety. If I start feeling more hunger and fat doesn't relieve it, I eat a little more meat. What it lacks in definition, it at least makes up for in simplicity. I started this on Monday, but the next day I was disappointed to discover that I had carelessly broken my Precision Xtra, and so I couldn't actually measure blood ketones. But I found a link to order a free one. It arrived yesterday, and I am delighted to report that I had a blood ketone measurement of 3.1! That's significantly higher than any previous measurement, and I retested later with very similar results, so I don't think it was an error. The other tack I'm taking is to start lifting weights again. It's been maybe a year and a half since the last time I was regularly lifting. Weight lifting is probably like aerobic exercise, in that by itself it doesn't lead to fat loss. For example, take a look at this typical, recent study. Its abstract points out that the participants who did a combination of aerobic exercise and weight training for 30 minutes, 5 days a week, lost "significantly more" fat than those who did only one of those. The way the study is written, and the data reported, distract from the fact that these people lost only about 3.3 pounds over 3 months of this intervention. This is in people who need to lose some 60 pounds of fat to be healthy. Just imagine yourself 60 pounds fatter than you want to be, committing to 5 days a week of probably commuting to a gym and working out week after week, and coming back 3 months later to find that you have lost 3.3 pounds. It's not something I would tout as particularly effective. Assuming it kept going at that rate (which is unlikely), it would take four and a half years to get to a healthy weight. Certainly, four and a half years down the road, it would be better to have lost fat at that rate than not to have, but again, the long-term effects are unlikely to be linear. The reason for this is that weight composition is a function of your hormonal state, and the effect of the food you eat is by far the dominating factor. In men the difference between either diet alone and that diet + resistance training meant at least as much fat loss but also a gain in lean mass instead of a loss. 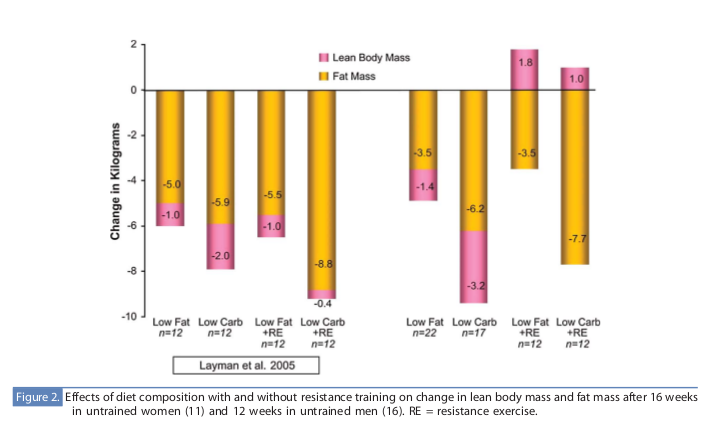 Women lost lean mass either way, but lost very little in the lower carb + resistance training situation. My lifestyle is not very conducive to scheduling long outings to child-unfriendly environments. This time I've decided to do short routines at home using body weight and some free weights. I'm rotating parts so I can do it every day, which is easier on my habit-forming abilities. I'll check back in next month, and let you know what happened. 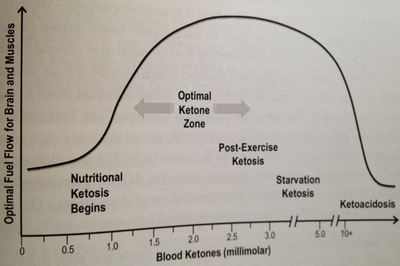 Volek and Phinney's Nutritional Ketosis graphic. This is just a quick follow-up to the last post, Are vegetables good for you?. In it I mentioned a study, the only one I knew of that actually compared a diet containing almost no fruits and vegetables, to one high in fruits and vegetables containing antioxidants. It turns out that a subset of those authors went on to follow this with two more studies designed to elucidate this further. "In several epidemiological studies, high intakes of fruits and vegetables have been associated with a lower incidence of cancer. Theoretically, intake of antioxidants by consumption of fruits and vegetables should protect against reactive oxygen species and decrease the formation of oxidative DNA damage. We set up a parallel 24-day dietary placebo-controlled intervention study in which 43 subjects were randomized into three groups receiving an antioxidant-free basal diet and 600 g of fruits and vegetables, or a supplement containing the corresponding amounts of vitamins and minerals, or placebo. Blood and urine samples were collected before, once a week, and 4 weeks after the intervention period. The level of strand breaks, endonuclease III sites, formamidopyrimidine sites, and sensitivity to hydrogen peroxide was assessed in mononuclear blood cells by the comet assay. Excretion of 7-hydro-8-oxo-2′-deoxyguanine was measured in urine. The expressions of oxoguanine glycosylase 1 and excision repair cross complementing 1 DNA repair genes, determined by real-time reverse transcription-PCR of mRNAs, were investigated in leukocytes. Consumption of fruits and vegetables or vitamins and minerals had no effect on oxidative DNA damage measured in mononuclear cell DNA or urine. Hydrogen peroxide sensitivity, detected by the comet assay, did not differ between the groups. Expression of excision repair cross complementing 1 and oxoguanine glycosylase 1 in leukocytes was not related to the diet consumed. Our results show that after 24 days of complete depletion of fruits and vegetables, or daily ingestion of 600 g of fruit and vegetables, or the corresponding amount of vitamins and minerals, the level of oxidative DNA damage was unchanged. This suggests that the inherent antioxidant defense mechanisms are sufficient to protect circulating mononuclear blood cells from reactive oxygen species." In other words, the conclusion is that in healthy people not exposed to high oxidative stress, extra exogenous antioxidants don't improve things. "There is only limited evidence that antioxidants in fruit and vegetables influence oxidative stress or antioxidative defense in healthy subjects. In particular, the contribution of nonnutritive antioxidants to the prevention of oxidative damage is uncertain. The present biomarker-based, fully controlled human intervention study supports the hypothesis that nonnutritive factors, as well as nutritive ones, in fruit and vegetables may influence oxidative damage; however, the effect is not uniformly protective and depends on the molecular structure targeted by each biomarker. " I'm not going to try to interpret these studies right now, but I wanted to list them for those interested in the topic. One problem that is interesting to me, though, is that they wanted to keep the macronutrient profiles of the groups the same. So they gave the non-fruits and vegetables group a drink containing some 60g of simple sugars. So one could argue that the fruits and vegetables group were at an advantage, because in addition to getting the simple sugars, they were getting factors that mediate sugars, that is, the fiber and possibly the antioxidants. While fiber is probably not beneficial in and of itself, if you are eating sugars, it can help moderate the damage. Similarly, if the conclusion from the first study is right, then the times you are going to see an effect of antioxidants, are the times when there is oxidative stress. Sugar consumption is one such candidate. So we've found ourselves in the situation of comparing apples to sugar. On the other hand, if they had not done that, then they would be comparing diets either with different caloric intake, or with differing proportions of carbohydrates. Then if the group not eating so many plants had fared better, it would not have been clear if the effect came from a negative effect of plants, or from the lower calorie / carbohydrate intake. Although this might appear to be a sloppy design, it's actually perfectly relevant, because it would address the question of whether or not it is warranted to tell people to replace some of their calories with more fruits and vegetables. This is a much more realistic question than whether we should tell people to get their carbohydrates from sugar-water as opposed to from fruits and vegetables. Nonetheless, for some reason, the addition of fruits and vegetables to the diet is heavily advocated, even without such studies in existence. Before I begin, let me briefly talk about my biases. I would like to emphasize that I always loved eating vegetables. Even as a child, I enjoyed eating the lowliest, most hated of vegetables, including spinach, broccoli, peas, turnips, and just about everything my talented cooks of vegetarian parents offered me. Later I discovered, quite by accident, that my most acute health problems could be completely alleviated by going from a very low carbohydrate diet that included large portions of non-starchy vegetables, to an essentially carnivorous one. However, I mostly have assumed that this drastic health improvement has been in spite of avoiding vegetables. I have been more likely to hypothesize that this difference is down to extreme carbohydrate intolerance, a need for a particularly deep therapeutic level of ketosis, or that I perhaps have some micro-organism invading my body, such as candida, that will flourish to my detriment even on cabbage, but will leave me alone if I eat only meat. More recently, and rather reluctantly, I have had to examine whether, in fact, vegetables themselves, or at least some of them, are what is causing me harm. In this post, I want to point to two sources that have helped me understand and embrace the idea that vegetables not only are not necessary for good health, but they may actually do harm in many people. The first is a curious small study from 2002 in the British Journal of Nutrition. The point of the study was to see if the anti-oxidants in green tea have a positive effect on oxidative markers of stress. In order to make sure the effect was coming from the tea, they removed all fruits and vegetables (except potatoes and carrots) from the subjects' diets. The researchers didn't find any long-term effects from the green tea extract, but they did notice something interesting. The removal of flavonoid containing elements of the diet did improve those markers. A "decrease in protein oxidation, in 8-oxo-dG excretion and in the increased resistance of plasma lipoproteins to oxidation in the present study points to a more general relief of oxidative stress after depletion of flavonoid- and ascorbate- rich fruits and vegetables from the diet, contrary to common beliefs." In other words, it appeared in this study that not eating fruits and vegetables was better for the participants than eating them. If nothing else, this must give one pause. The second I came upon just this week. At the 2nd Annual Ancestral Health Symposium 2012 (AHS12), Georgia Ede, M.D. gave her presentation titled "Little Shop of Horrors? The Risks and Benefits of Eating Plants". In it and on her website, she points out that there are no studies that she could find (and the above is the only one I know of) that actually compares diets with and without vegetables. The studies that she did find that showed positive benefits to eating vegetables are all flawed in some way such that it can not be determined which aspect of the intervention gave a positive benefit. For example they had people eat more vegetables and less refined sugar, or eat more vegetables and exercise more. Moreover, the only studies she found that did not have these confounders, had negative results, that is, they did not show the benefits the researchers were expecting. Of course, this is only absence of evidence, but with the extensive promotion of vegetables that we are exposed to so vigorously, one would hope to see something more concrete behind it. Dr. Ede notes that there have been groups in the past that survived fine without vegetables. She makes cogent arguments against the assertions that fiber is beneficial, and that vegetarians are healthier than non-vegetarians. She shows that micronutrients are more abundant and/or more bioavailable in animal foods than in plants. Yet the most important insight she provides from my perspective is that there are many compounds in plants that function as protection for the plant, to prevent it being eaten. Even though many people can tolerate them at low levels, in high doses (or low doses for sensitive individuals) they are at best double edged swords, and at worst harmful. This is true even of compounds that have been touted as health-promoting, such as anti-oxidants. 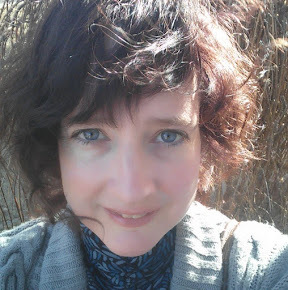 She promises to write about many classes of toxins, and the first article has already been written. It describes the problems with brassicas (a.k.a. cruciferous vegetables). When I was on a simply low-carb diet, instead of a "zero-carb" diet (that's a bit of a misnomer, since there are trace carbs in meat, and I sometimes eat liver or cream, which have a bit more) I ate a lot of those, because they are very low in carbohydrates. As she claims seems to be the pattern, the ingredients in brassicas that are advertised as fighting disease, also cause problems, actually poisoning mitochondria, generating ROS's, and more. I recommend reading her post, and the rest of her site. "[P]erhaps these compounds are really only irritants that we've had to evolve to deal with because we happen to eat them, and maybe [it's not the case] that they're actually good for us."